The Dominican Friars are a male religious order within the Catholic Church. We are called ‘Dominicans’ after our founder, St Dominic, who established the order in 1216. We are recognisable by our distinctive black and white habit and the rosary that hangs from our belt. Our order includes a great number of saints and blesseds, such as St Martin de Porres, St Thomas Aquinas, and the artist Fra Angelico. 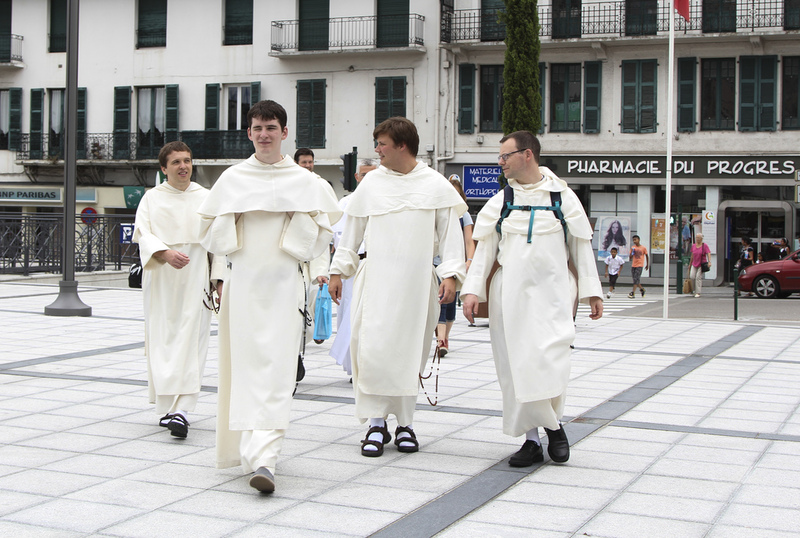 The Dominican order is now present all over the world, and involved in a wide variety of activities. We are blessed with many vocations, meaning that there is a strongly youthful aspect to the order. As the ‘Order of Preachers’, at the heart of our vocation is the task of explaining the Catholic faith in a reasoned way. In a secular age which has little understanding of religion, our charism is very much in demand, and we are very involved in preaching, teaching, giving talks, writing books, and so on. St Thomas Aquinas, the great Dominican philosopher and theologian, continues to be our inspiration and guiding light in this area, and we constantly find new insights into contemporary questions through his writings. In our preaching, teaching and pastoral work, and as members of Christian communities, we are guided by a great emphasis on charity – we seek to serve with friendship and love everyone we encounter, no matter what their background; meeting them where they are at in their personal journey, and hopefully taking them one step further towards the truth that God wants to share with them. The friars have been present in Britain since 1221. The historical sites of our houses have left their mark on the geography of Britain in the many places still named ‘Blackfriars’ after us. Our communities today are based in the cities of London, Oxford, Cambridge, Leicester, Newcastle, Edinburgh and Glasgow; and in 2012 we also established a new house in Durham. Numbering around 90 men in total, the Dominican Friars of Britain serve around 50 different institutions, including some overseas. The friars are mainly engaged in priestly ministry in parishes and chaplaincies. Importantly, we are present in more than a dozen universities, teaching students and providing pastoral care. Our pastoral work in general is often undertaken at the service of vulnerable people: prisoners and young offenders; the homeless; asylum seekers; the poor; the elderly. We are involved not just in providing spiritual help, but also in practical charity, working with lay people to make sure funds are raised and physical needs are met. We see this as an important part of our calling, and it fits alongside our involvement in research and debate on issues to do with social justice. We enjoy a very close relationship with the lay people we serve, who become united with our communities of friars in worship and prayer, in the celebrations of the Christian year, and in the day-to-day reality of normal life. This has resulted in many longstanding friendships with individuals and families, sometimes over several generations. We also serve the Church as a whole by training clergy and religious brothers and sisters for other orders, including men and women from the UK and overseas too. The other parts of the Dominican family are supported by us, including the various orders of Dominican sisters, and Dominican associations of lay people. As can be seen then, Dominican friars play an important role in modern Britain, serving the Church and society at large, not only through the intellectual life but also in practical ways.